This 4-port portable USB 3.0 hub with built-in cable turns a single USB 3.0 port into four, letting you connect more of your devices to your computer. The hub features a built-in cable that is longer than what most traditional hubs offer. The extended-length cable gives you the flexibility to place the hub and your devices exactly where you want them, and it ensures the hub can connect to your laptop or tablet regardless of where the laptop's USB 3.0 port is located. Add four external USB 3.0 ports to your notebook or Ultrabook™ with a slim, portable hub. Great for adding extra ports to your Ultrabook™, tablet or Macbook®, this portable usb hub offers a block-style design with ports across top of the hub so devices like USB keys or wireless keyboard/mouse receivers sit upright on the desk. Or, the hub can be laid on its side for easy cable connections to devices like external hard drives or printers. 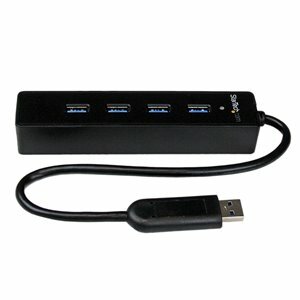 The four port USB 3 hub supports USB 3.0 data rates (5 Gbps - up to 10x more than USB 2.0) and is backward compatible with USB 2.0 and 1.1 devices, for simultaneous connection to new and legacy devices.